Shan Brother – Club Shan Online will help you connect to the others with the same interest and feeling. - Light size - Fast Download and Install. - Run smoothly even with slow Internet. - Auto reconnect if you got bad internet connection. - Invite your friends and relatives to play and receive up to million in game chips. 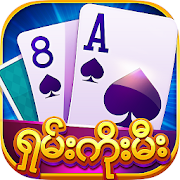 Download Shan Koe Mee to play and earn free chips today! - The game are intended for an audult audience. Feature: Light size - Fast Download and Install. Pic 1: Light size - Fast Download and Install. Pic 4: Auto reconnect if you got bad internet connection.